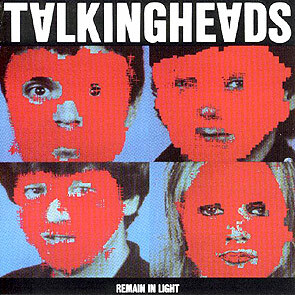 8 responses to "Talking Heads: Remain In Light"
You could say it sounds like Joy Division only more so. Bliss….. I was just going to post that word, however i’m a bit manic at the moment, so here is the other thought stream. Discovering music has to rate as one of life’s finest experiences, and when it is this good it marks out our passage as it changes us. Words such as transcendent, beautiful and sublime all apply here. I count myself as a fan of both Brian Eno’s and David Byrne’s work. ‘My Life In The Bush With Ghosts’ is one of my favourate albums (just re-mastered and released for a new generation I notice, and receiving great reviews again). Somehow ‘Remain In Light’ slipped past my radar, so thank you Jim for prompting me to discover a masterpiece. I saw David Byrne perform in Edinburgh in 2004 and he is still deeply subversive. Revamped versions of Talking Heads songs retook the relevance they had lost from radioplay overkill. Crosseyed and Painles remains one of my favourite Talking Heads tracks – driving; hurting; insane – overpowered by the world. If you can get your hands on it, ‘Feelings’ features another load of subversion. Pisces, I’m something of a Byrne completist. I’ve even got all his ‘mail-order-only’ stuff, a rare vinyl copy of ‘Music for The Knee Plays’ and his various books. Feelings is indeed a fine album (though possibly not amongst his best) and the tour to promote it was amazing. I’ve seen him tour every album since the eponymous one. I met him a few years back and shared a sandwich with him while he enthused about Microsoft Powerpoint and his new equation… “Strange = Good”. I don’t think I was too “fanboy”, but it’s hard to know. Nice one Jim. I can imagine myself turning into a babbling mound of spittle in the presence of someone like that. The Forest is a lovely album. Also excellent, Phil, is the EP released just afterwards called Forestry which contains a bunch of remixes of the album tracks. A couple of the mixes are a wee bit weak, but it’s well worth tracking down for the Jack Dangers (of Meat Beat Manifesto) remix of Nineveh alone, which is absolutely stunning. I recall an interview with Byrne a few years after the “Strange Ritual” book was published in which he was asked whether he’d consider releasing a cd-rom or website of the book. He was vehemently opposed to the idea, arguing that the whole point of the project was that it was a book… a physical object that could be touched and smelled. He used the word “fetish” in its broadest sense and – just like his other books (“Your Action World” and the exquisite “The New Sins”) – it really is an object worth owning, in a way that a cd-rom of images just wouldn’t be. Half of the book is in English, the other half is a Spanish translation, and it was put anonymously – in place of bibles – in every hotel room in Valencia during the 2001 Cultural Festival (it was his ‘installation’ at the event). I’m not one to overuse the word “genius”, but it truly applies to Byrne. You simply have to hear it for yourself… assuming you have the appropriate speaker setup. …and a suitable DVD player, as there’s a very noticeable difference between the Advanced Resolution (DVD-Audio) tracks and the bog-standard Dolby Digital ones. I’m listening to the former right now (I bought the CD/DVD on the strength of Jim’s rave), and they are indeed jaw-dropping.